Late last month, we told you all about SwiftKey Flow, a Swype-esque style of swiping a QWERTY keyboard to type. It will be included with SwiftKey 4 which has yet to make an appearance in the Google Play Store. But one place where you might find it is on the Samsung GALAXY Note II. For some owners of the device, while the SwiftKeyFlow shows up in the "Language and Input" menu, it is not functional. For others, they are swiping away to create emails and texts. While SwiftKey has been an extremely succesful third party virtual QWERTY option for Android users, the main advantage it has over the competition is with text prediction. While the app is normally priced at $3.98 for either Android flavored smartphones or tablets, a free version that works for one month is available. SwiftKey is the number one app in 30 countries and has sold over 1.5 million copies. 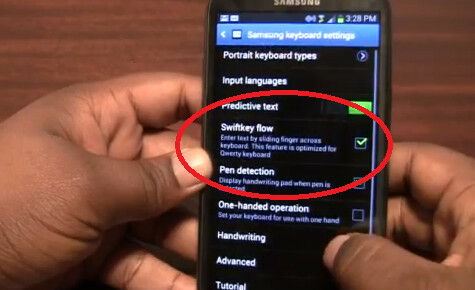 Does your Samsung GALAXY Note II offer a fully functional SwiftKey Flow? Let us know by dropping a comment in the box below. Also, since it is germane to the issue, let us know which carrier's name graces the unit in your possession. Since when can 3rd-party apps be installed in stock ? Aren't those free apps ? Swiftkey is not free, afaict. Does anyone have any idea when Swiftkey Flow will be released to the Play Store? It's there on my Verizon Note 2, but I can't get the keyboard to look like swiftkeys. When I turn it on it still is Samsung's keyboard with the blue trace line. if am correct and i think i am is that samsung have licensed the technology from swiftkey to use on their own keyboard...so you get all the swiftkey features but on a samsung skinned keyboard. Oh excellent, swiftkey is my favorite keyboard as of right now so that's a nice thing to know that i don't need to add on a separate app.